February can be a surprising month for those new to Catalunya. Visitors to Barcelona are sometimes struck by the seemingly non-Mediterranean feel of the temperatures, while new transplants to the city sit tight, not-so-patiently awaiting summer. In this at-times bleak in-between, the Catalan tradition of the calçotada is a welcome highlight signaling the imminent arrival of spring. 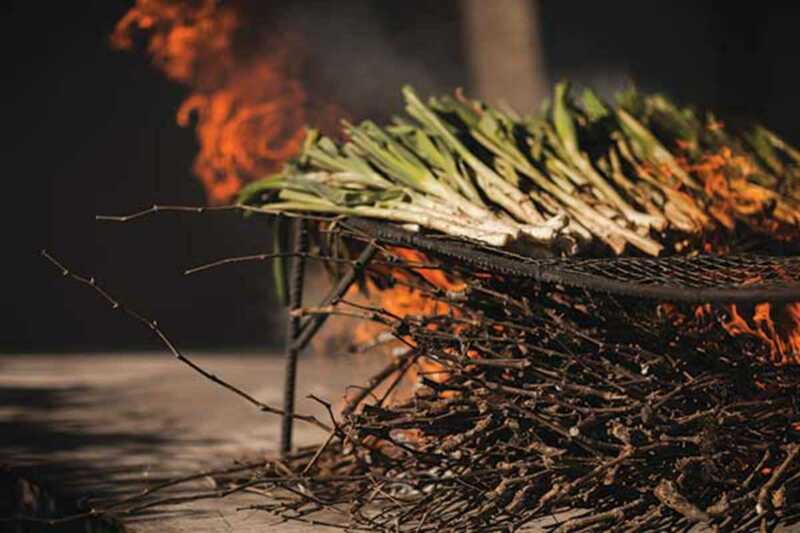 The calçotada is the event that celebrates the beloved calçot, a wild spring onion that grows in the woods and national parks throughout Catalunya. Its harvesting period is determined by the conditions of each particular season, but most years it is possible to find calçots on the menu from the beginning of February until the first weeks of March. Families and restaurant owners grow or forage for their own calçots and then gather together in groups to happily feast on their spoils. It has become such a well-loved tradition in the region that the anticipation of this annual event is almost tangible. Although it is possible to find restaurants offering a calçots menu throughout the season, the best place to enjoy them is outdoors, either at a park in the countryside where there are grills available to cook your own calçots or at a masia, those rural houses in the Catalan countryside that often house family-run restaurants or small pensions. It is said that the tradition was begun at the end of the 19th century in Valls, in the region of Tarragona an hour south of Barcelona. Legend has it that farmers inadvertently burned their freshly dug calçots over a fire that got too hot, only to discover after peeling the burnt exterior away that the inside remained tender and savory. The rest, as they say, is history. As the star of the show, calçots typically open the meal and are followed by plates of grilled vegetables, potatoes and all manner of meats, including the beloved butifarra, a white or black pork sausage native to Catalunya. Calçots are dipped into a thick savory sauce called romesco, a particular point of Catalan gastronomic pride. Romesco is made by roasting tomatoes, ñora peppers, garlic, olive oil, almonds and hazelnuts and blending them together with a dash of vinegar into a thick, fragrant salsa. It is so well-loved that when asked about their favorite aspect of the calçotada, many a Catalan will wax poetic about the virtues of this memorable sauce. Traditionally, the onions are served in an oversized pile on clay roof tiles and consumed in a rather ritualistic manner. It begins with holding a calçot by its green inner stems and squeezing the tip of the onion at its the roots until the charred outer layers slip off, leaving the fresh white onion in hand. Then it’s plunged into the romesco sauce, lifted high above the head and consumed, bite by savory bite. Each has their own method, of course, and not everyone subscribes to the head tilt, but apart from the little plastic bibs eaters are issued before the meal, there is little other option for staying clean. Charred bits of onion blacken fingers and streak faces. Oil from the romesco dribbles down the chin. Sleeves are pulled up, napkins destroyed. Suffice to say, the calçotada is not an event for the vain or weak of heart. Of course, a calçotada is never complete without vi casera, the house wine served in a porró, a glass jug with a long spout meant for pouring the beverage right into the drinker’s mouth. If the destruction wasn’t complete from the calçots, the oft ungraceful attempts to master the porró usually takes care of the rest. It’s a festive part of the event and another reason the infamous bib has become such a useful component. Like many regional gastronomic traditions, the calçotada is a time for family and friends to gather together and to share food, stories, and laughter. Pol Playa, a Catalan who grew up in the Barcelona neighborhood of Sants, loves escaping the city to celebrate the tradition of the annual calçotada. “What I love most is the ambience, to be somewhere outdoors with the smell of the brasa (coals) on a sunny winter day,” he says, referring to the open-air grills where the onions are cooked. To be surrounded by family and friends and to enjoy good food, he says, are all he needs for the perfect calçotada. Anna Francesch grew up in Tarragona, deep in the heart of calçots territory. Although she lives in the city now and leads a busy life as a piano teacher and vocalist, Francesch still makes time for the annual ritual. “I’ve always loved it,” she says. She still remembers what it was like to eat calçots as a small child. Francesch cites family, friends and romesco as the three elements that make a calçotada a true success. “It’s a festivity everyone can enjoy from 3 years old to 99,” she explains. For most, it’s a reason to pause, to make time to connect to others you care about, and to share in a common experience. As a local, she understands that. As foreigners in a land rich in tradition, we should too.